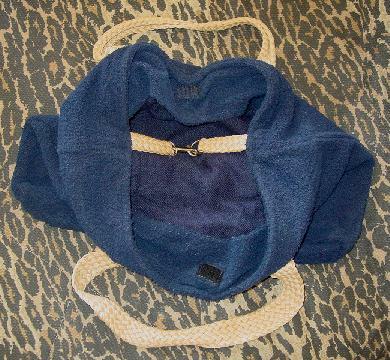 This vintage dark blue terrycloth purse has two 23 1/2" by 1 3/8" woven twine handles and is by Pierre Cardin. Each top end side has a 3 1/4" long by 1" wide woven strap, with one end having a silver-tone safety hook and the other having a silver-tone metal modified ring. The interior top centers have a small black velcro closure. It has a separate black fabric lining. 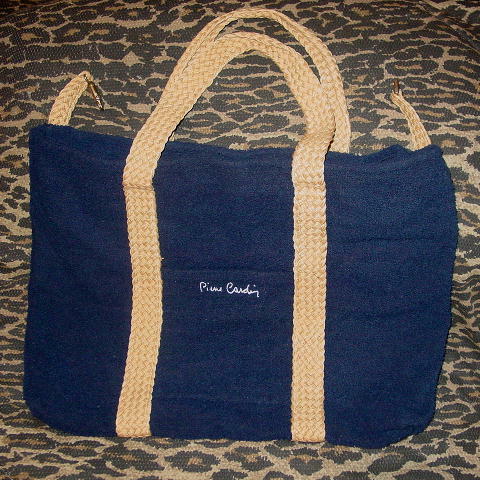 The deep front center exterior pocket has Pierre Cardin on the front in white embroidered letters. There is a 4" interior top strip of terrycloth.